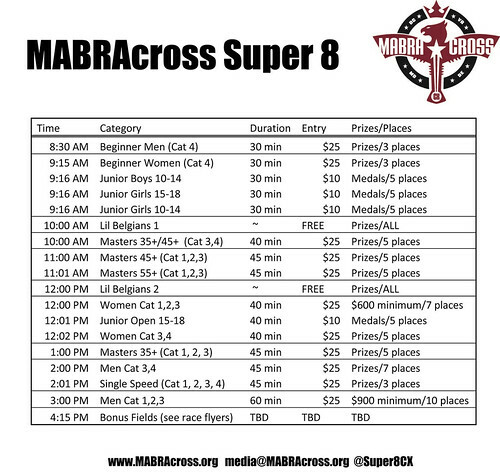 The BikeReg.com MABRAcross Super 8 cyclocross series released its daily schedule, today. There is something for everybody in this race day. See it all below in the handy chart. Man, I can’t wait for this season to start. Damn. Are yall serious? Killers Bs to 2 PM? Of course the year that I move away is the year that yall move the start time of my race to a reasonable hour. Wonder whats its going to be like in GA. Watch the 3/4 go off at 10 AM. Hope to make it to DCCX this year, even though it’s a 9 hour drive. Things look fine, but is there really a big enough field for the Masters 45+ and 55+ to have there own time slot be themselves? Seems to be a lot of Jrs out racing — big enough for their own field/slot for ’12? Possibly start the Jrs out earlier? Great to see so many female racers out there these past few races!